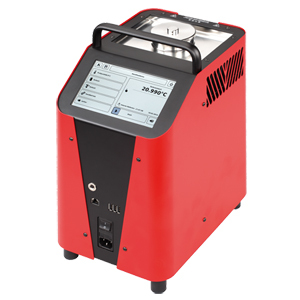 OMEGA''s new, portable temperature calibrators are lightweight and easy-to-use. Five models are available to cover the range from -35 to 650°C and wet or dry insertion, non-contact and surface calibration requirements. Why calibrate? Temperature sensors are subject to mechanical, thermal and chemical stresses. This results in a drift in output over time. Regular calibration of the sensors provides information on the difference between the actual temperature and the measured temperature and makes the specific drift visible. This data can be critical to maintaining a stable process operation. OMEGA™ Dry block calibrators and micro bath calibrators are one of the best means to check and calibrate a wide range of temperature measuring instruments and temperature sensors. Mechanical, electro-mechanical or electronic measurement equipment can be checked with ease. These compact and durable calibrators are easy to transport, user friendly and offer all the features required for industrial and laboratory calibration requirements. Adaptor Sleeve, blank; for drilling as required. Adaptor sleeve, 2 bores 1/4 and 1/8" dia. Adaptor sleeve, 3 bores 1/2, 1/4 and 1/8" dia. Adaptor sleeve, 4 bores 1/8, 3/16, 1/4, 3/8" dia. Adaptor sleeve, 7 bores 6 x 1/4 and 1/8" dia. Adaptor sleeve, 7 bores 1/8 and 2 x 3/16", 2 x 1/4",2 x 3/8" dia. Notas: * Tub insert aids quick changes (no cleaning). Ordering tub insert with the micro bath includes the tub in the calibration. To order the function accessories with the base, order base and add suffix “-B”, “-D”, “-I”, “-S”.